Since truth is the only meaningful foundation upon which we can make wise decisions, how then can one establish what is really true? Increasingly more people are finding that making wise decisions is becoming more and more difficult because of the ultra-interconnected world in which we live. Constantly forced into our consciousness is an incessant barrage of counsel, advice, and promotions. It is done by a bewildering array of media, Internet, and other means. On a given subject we can receive multiple strongly delivered, carefully crafted messages with solutions. But often two of the solutions can be diametrically opposed. No wonder some are confused and are not sure how to make the right decisions. To further complicate matters, others try to persuade us that our decisions must be socially acceptable and politically correct. Some pondering of that approach will reveal how wrong it is. Since social and political structures differ widely over the world and can dramatically change with time, the folly of using that method to make choices is apparent. There are two ways to find truth—both useful, provided we follow the laws upon which they are predicated. The first is the scientific method. It can require analysis of data to confirm a theory or, alternatively, establish a valid principle through experimentation. The scientific method is a valuable way of seeking truth. However, it has two limitations. First, we never can be sure we have identified absolute truth, though we often draw nearer and nearer to it. Second, sometimes, no matter how earnestly we apply the method, we can get the wrong answer. The best way of finding truth is simply to go to the origin of all truth and ask or respond to inspiration. For success, two ingredients are essential: first, unwavering faith in the source of all truth; second, a willingness to keep God’s commandments to keep open spiritual communication with Him. 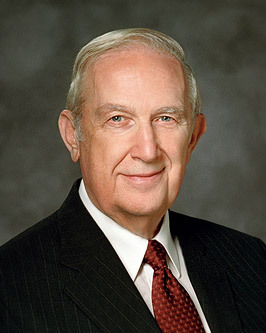 Elder Robert D. Hales has just spoken to us about that personal revelation and how to obtain it. Every member will have opportunities to sustain through service given in the name of God. The Church is a powerful force for the blessing of its members and all people across the earth. For instance, the Church has done remarkable humanitarian work across the earth. All of that is possible because of the faith of members and of friends that God lives and that the Lord wishes to succor all of those in need whom He can reach through His faithful disciples. Additionally, it is through the Church and the ordinances which are in it that the blessings of the sealing power reach into the spirit world. This is a true and living Church, reaching even to those who are no longer living. As you have the faith to find the names of your ancestors, as you go to the house of the Lord to offer them vicarious ordinances, you sustain this great work, whose purpose is to offer salvation to all of Heavenly Father’s children who come into this world. I would like to speak of some of the reasons I see for gratitude for a true and living Church. Then I will suggest some ways in which I see the Church being prepared for the Savior’s return. And finally, I will bear my testimony of how I have come to know that this is the true and living Church. 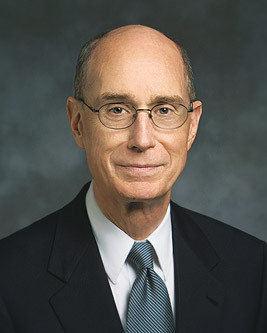 I want to say to the Latter-day Saints that it is our duty to put our faith in the revealed word of God, to accept that which has come through inspiration, through revelation unto his servants, the prophets, both ancient and modern, and whenever you find any doctrine, any idea, any expression from any source whatsoever, that is in conflict with that which the Lord has revealed and which is found in the holy scriptures, you may be assured that it is false and you should put it aside and stand firmly grounded in the truth in prayer and in faith, relying upon the Spirit of the Lord, for knowledge, for wisdom, concerning these principles of truth. If you will walk in the light as I have read here, and will receive the doctrines of our Redeemer, he will grant unto you, through the inspiration that will come from the Spirit of the Lord, a testimony of the truth and you need not walk in darkness nor in doubt, but may have a clear and a distinct comprehension, and understanding of the truth which will make you free. 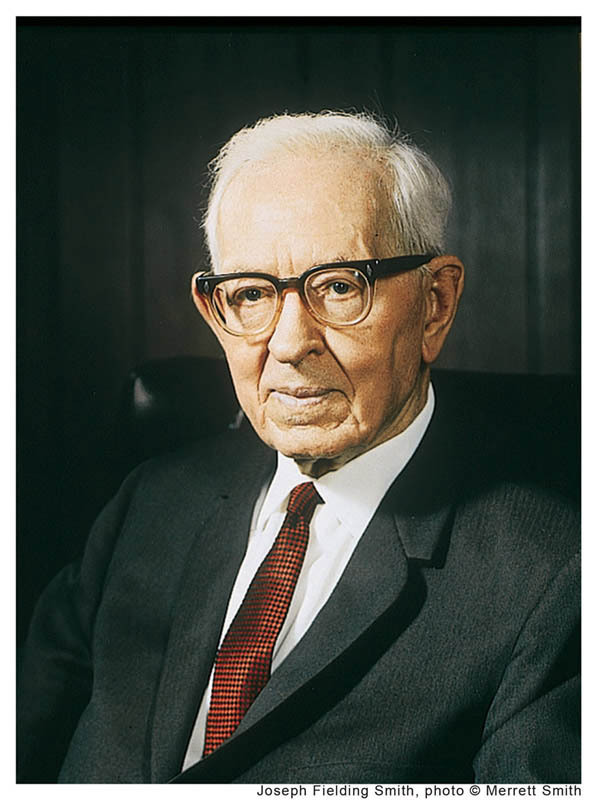 It is our duty to seek the Lord, to obey his laws, to keep his commandments, to put away from us lightmindedness, foolishness, and the false theories, notions, and philosophies of the world, and to accept with fulness of heart and in humility these solemn, God-given principles which will bring unto us eternal life in the Celestial kingdom.